Mark Cavendish: Can Etixx-Quick Step rider achieve 2015 goals? Mark Cavendish is not happy. Our chat at his team Etixx-Quick-Step's training camp in Spain had started well - smiles, handshakes, "how are you" exchanges - but I have ruined it by bringing up the one subject guaranteed to annoy him: Christmas. "It is rubbish [except it was not 'rubbish']," cycling's fast-talking fast finisher said. "It's the only day of the year you ever see pros posting pictures of themselves on bikes and I'm not having it. "So they went for a ride on Christmas Day? Big deal. "I bet they didn't ride very far, or train properly the day before or day after." Training while many millions of people slump semi-comatose on the sofa, top trouser button undone, has become an article of sporting faith ever since St Daley of Thompson first delivered his Yuletide sermon for success. But Cavendish has made a career out of not conforming. From his early days as the tearaway at the bottom of British Cycling's power-data class, to his bunch-sprint bust-ups with blazerdom, the Manxman has done it his way and his way has worked, despite what the sports scientists' devices were telling them. The question is: does his way still work? Christmas aside, the 29-year-old is coming off perhaps his best winter's training since first arriving in the professional peloton as a track tyro with quick legs and an F1 engineer's dream profile on the bike. Successful appearances on Europe's six-day circuit before his Christmas break set him up nicely for his team's winter training camps, and he heads to his first race of the season next weekend, the Tour de San Luis in Argentina, with his only excess weight being a fashionable beard. And that will be coming off come race day. But he is also coming off two, by his own remarkable standards (a point that must be emphasised), mediocre years. Worse than that, for the first time since exploding on to the scene in 2007, there is somebody doing his thing - winning bunch sprints in the biggest races - better than him. Not that he is having that either. "He only won two more races than me last year, you know?" said Cavendish with just the right amount of emphasis to make the point, but without sounding rehearsed. "And that's with me missing the Grand Tours. So I think I had a pretty successful season, which is kind of overlooked." The "he" is Marcel Kittel, of course, the kind of bloke who posts "great numbers" in lab tests and does go training on Christmas Day. He is also three years younger than Cavendish. The giant German has won 10 Grand Tour stages over the last two years, including back-to-back wins in the Tour de France's finale on the Champs Elysees - the drag strip that Cavendish owned between 2009 and 12. Kittel has also never lost a bunch sprint that his British rival has gone on to win, and while the Team Giant-Alpecin rider still lacks the depth and variety of Cavendish's CV, he has two yellow jerseys in his wardrobe, the second coming on a day that encapsulates how things have gone for the two men since 2012. The setting was Harrogate, the Yorkshire hometown of Cavendish's mother, and the day was 5 July, the first stage of the 2014 Tour de France. Cavendish had recced this route at least twice, and had made no secret that it was his prime goal for the season. Consequently, his race programme was cut back to allow him to arrive in Yorkshire rested and ready to roll. Millions lined the roads to cheer him on. But Kittel had done his homework, too; he also had the confidence that pre-Tour success brings and the peloton's best-drilled sprint lead-out. So, as the road past Betty's Tea Shop ramped up, a flying Kittel was delivered to the front of the race and everybody else was told: "Get around that, if you can". This is exactly the type of conundrum Cavendish used to solve with what looked like ease (but was actually a thrilling combination of talent, timing and technique), but were those tests as tough as Kittel's? That is hard to say. What we know is that Cavendish found himself further behind Kittel's wheel at the crucial moment than he would have liked - again - and that prompted him to go for a gap that really was not there. The result was the biggest groan Harrogate has ever emitted, a separated shoulder and a first year since 2008 without a win in one of cycling's three Grand Tours. Kittel would go on to win three more stages over the next three weeks, with Cavendish's other current nemesis Alexander Kristoff taking two. 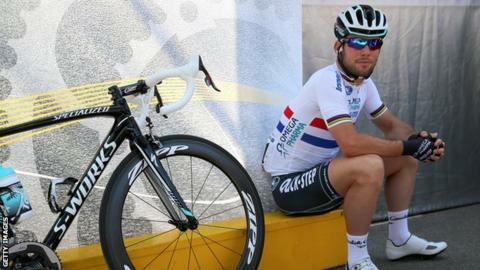 The closest Cavendish got to them was a day spent as trainee coach/part-time cheerleader in the team car, which is not what Etixx-Quick-Step boss Patrick Lefevere pays him £3m a year for. Not that Lefevere is complaining as such - he has been "in this circus long enough" to know accidents happen - but they do go into the third and final year of their contract together still waiting for total satisfaction. "I gave him a deal for three years and we're now in the third year," Lefevere said, giving every impression of an investor still confident that his ship will come in. "And if I look at the average of those years we're quite happy." After all, 14 wins in 2014, and 22 in 2013 is not a bust, particularly when 2013 included seven Grand Tour stages and the points jersey at the Giro d'Italia, exactly the kind of return Lefevere was hoping for when he tempted Cavendish to leave Team Sky. "OK, last year went badly, more for him than the team, because if your best rider falls in the first week you can panic or you can go for plan B, which is what we did - we won three stages without Mark, unfortunately," the Belgian explained. "But knowing him, and seeing how he has gone this winter, I'm very confident he can achieve his goals this year. "I've always said that if you can win a nice one early on, you'll be fine. "I'm convinced he can win Milan-San Remo because last year he was ill a week before the race and still almost won (he came fifth, his best result in the season's first big one-day race since winning it in 2009). "Mark needs targets. So I think San Remo, some stages in the Giro, then the Tour, and he'll be OK."
As far as the rider's own targets go, they can be categorised thus: "I just want to win; it's as simple as that." When pressed for a bit more detail, Cavendish said Milan-San Remo, a 298km slog that often includes extreme weather, was a "big goal" but admitted that was easier said than done in a race that offers hope to a wide range of talents. He can also no longer pull the stunt he so spectacularly carried off six years ago - when he managed to convince the rest of the field that he climbed like an elephant and would not be in the mix after the bumpy run to the finish - but, on the flipside, he now knows he can win the toughest races without having to fool anybody. "Look, there is so much expectation placed on me now, because I don't lose very often," he said with a mixture of regret and richly deserved pride. "But that's all right, I'm not complaining. I love the sport, love my team and love being successful." And when you have been as successful as Cavendish has, for as long as Cavendish has, you deserve a bit of faith in your ability, and Christmas Day off.